This page will focus on how to make sure you are choosing a professional removal company, which is very important as you are entrusting them with your worldly possessions. We have compiled separate advice on packing for your removal if you are looking for specific packaging advice. Sadly there are many sub-standard operators in the removal industry, and the specialist market of removals to Greece is no different. Of the top search listings for “removals to Greece”, almost all of them are not removal companies but “lead generators” – websites that take your details and sell them to transport companies, without discerning about quality. The others tend to be “virtual” removal companies (who have a website and sometimes a warehouse, but do not actually do the removal to Greece themselves), and man-and-van outfits claiming to be removal companies. Many people also rely on chat forums for recommendations, but it is not always easy to recognise dodgy operators, and people can be easily tricked. For example, the recent case of the removal company on the Greek island of Crete who let down many customers and allegedly stole from several people should be a warning. The company had a very nice website, was very active on chat forums and social media and built quite a following, before abruptly absconding. It is worth understanding the differences between professional removal companies and the rest. This page will highlight the most important factors to consider when choosing a company to handle your removal to Greece and the Greek islands. The British Association of Removers (BAR) is the trade association for the removal industry in the UK, and is recognised internationally as the standard-setter for the industry. All professional UK-based removal companies will be members, and professional companies based in other countries will be “International Associate” members. BAR members are bound by the BAR Code of Practice, carry insurance to a high standard, and must act professionally at all times. This one criterion will satisfy points 2,3,4,6,7 and 8 below. Remember that BAR membership is entirely different from membership to general haulage associations like the RHA etc – these bodies have nothing to do with the specialist handling of furniture and personal effects. Even dodgy companies will say that they are covered by insurance. Heres how to tell if the insurance is worth the paper its written on. The British Association of Removers is happy for removal companies to offer either type (1) or (2) above, since these are the only two ways in which your goods can be covered by insurance during transit. Man-and-van companies and general hauliers (even many companies who claim to be Removal companies), will try to tell you something similar to point (3) above. Be very wary about this. It is true that the company will have Goods In Transit or CMR insurance. But this is just a technicality. All international transport companies have to have this cover. Sometimes on the goods in transit insurance certificate it also mentions removals  this makes no difference. This insurance is just a blanket cover that the company must buy once per year to cover all of its activities in that year. It is a very cheap, once a year expense, because in reality it doesnt really cover anything. This cover protects the haulier, not the customer. The policy is in the hauliers name, and is extremely difficult for the haulier to claim against except for in the situation of total loss (like a truck catching fire or a ferry sinking). But even if the haulier can successfully claim against it  it is the haulier claiming, not the customer. 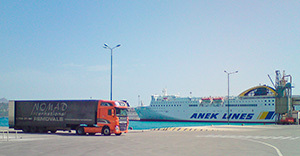 If the customers goods are all totally lost due to a ferry sinking and the haulier manages to make a claim under the goods-in-transit insurance, the customer has to hope that the haulier will pay the money to the customer, since the customer does not have an insurance policy to claim against himself. Goods in transit or CMR insurance is basically useless to the customer, and these companies should not advertise that they are covered by it, since it is highly misleading. But many companies do advertise this, so beware. If you do not have the option to complete a valuation form and take out proper insurance, then you are not covered by insurance at all. You are at the mercy of the goodwill of the haulier covering any damages himself, out of his own pocket. Ask the company for a summary document showing their insurance or their Standard Liability contract conditions and you should be given them by return for checking. If there is any delay the chances are that they do not have the correct protection. If the company does not mention insurance at all (point (4) above), you are not covered. For your goods to be covered in transit, the insurance company must be given a detailed list of the items you are transporting and their values, otherwise there is no way that they can cover you for loss or damage. Therefore a professional removal company will always ask you to complete a valuation form for your goods if you would like to take out insurance to cover them. The cost of your insurance protection (either type (1) or (2) above), will be a small percentage of the total value of all of your goods. Over the past few years a phenomenon has arisen of “Virtual Removal Companies” – these companies do not carry out any removals to Greece or Italy themselves, rather they are just a web site and sometimes a warehouse, and they will act as the front man dealing with the customer, while subcontracting out all of their collections and deliveries to other companies. The consumer often does not realise that this is the case. They often have catchy names like “Removals to Greece” and as a result they typically rank very highly in search engines. But they are not an actual removal company – they are more like a freight-forwarder coordinating the different parts of the transport process on behalf of the consumer. The trouble is that the consumer does not know who they are actually dealing with, who is actually in possession of their goods at any time, or indeed if they will actually speak English when they arrive. Real removal companies will handle the entire removal themselves, from door-to-door. On the rare occasion when it will work out cheaper for the customer if a third-party specialist is used for one section of the journey (such as a collection from Ireland), the removal company will be up-front and suggest this in advance, and only proceed with this method if the customer would like to. In all other cases the removal company will handle the entire journey themselves. This may sound obvious, but proper removal companies will send enough men to your home to carry the items out to the vehicle on collection, and carry the items into your new home on delivery. Small man-and-van or man-and-truck operators will only have one man on site, so you will need to help him to load and unload the vehicle. Some customers will ask their professional removal firm if their quote can be reduced if they only send one man to deliver (this can save money in remote locations) – this is fine but it should certainly not be standard practice. Unless the customer requests otherwise, he or she has the right to assume that the removal company will do all of the lifting themselves. 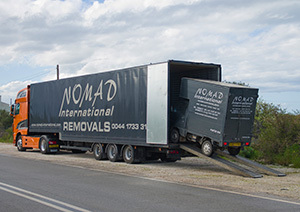 If you are moving from Cornwall to London you don’t really need a specialist remover. But if you are moving to an unusual destination then it is important your removal company is familiar with the logistics and complexities involved in conducting a removal to this location. 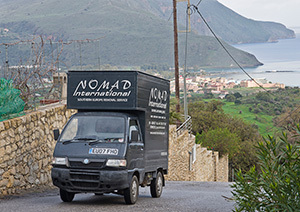 For example, Nomad International specialises in removals to Greece, removals to the Greek islands and removals to Italy. We have detailed knowledge and experience in conducting removals to the tiniest Greek and Italian villages, the most remote locations and the most difficult-to-access islands in these countries. If you need to lift a piano over a balcony into a fourth-floor apartment in Athens, or if you are moving to a Greek island where vehicles are not allowed and the delivery has to be made using donkeys, we can help you. We know that the fastest route to Kefalonia is not via mainland Greece. We know that the village of Lindos, on the island of Rhodes, is pedestrian-only and that the town of Amelia in Italy is not accessible to long vehicles. On Crete we even have our own team of British expat removal professionals permanently on-site to handle work at short notice. While many companies (particularly “virtual” removal companies) say that they specialise in removals to Greece or removals to Italy, in fact they are not specialists at all. Many of these companies have a number of other web pages where they claim to be “specialists” in almost every country in Europe! Each of their web sites will have that country’s name in the web site address and their trading name, resulting in high rankings on Google and making them really look like specialists. Don’t be fooled. Make sure your removal company is ready for the challenges involved in a removal to your new country. In both Greece and Italy it is very common that large removal vehicles will not be able to get right to your door. Make sure your removal company has a plan to be able to access your property if this is the case. Nomad International uses purpose-built on-board porter vehicles for the movement of household goods & personal effects. These fantastic vehicles ensure that we can access even the most difficult-to-reach destinations. Indeed, in key locations in Greece we have our own small vehicles permanently available on site to assist with delivery. Your removal company should have their own secure warehouse in the UK, and preferably should also have accounts with professionally-operated commercial storage facilities in Greece should you require storage there. The BAR does not recommend blanket-wrapping as a techinque for overseas removals. This technique is only suitable for local removals within the UK. Blankets can be used to provide additional protection around particularly fragile surfaces, but they are not adequate on their own. This is not because the items are likely to be loaded incorrectly or dropped – it is to do with the vibration that occurs inside the vehicle and the resultant minute rubbing of items against one another. Over a few hundred kilometres this is not significant, but over distances of thousands of kilometres blankets can become loose and scuffing of items can occur if they are not export-wrapped in other protective materials. Your professional removal company must be qualified in export packing and wrapping furniture and fragile items using the appropriate packaging materials (furniguard, tissue paper etc). They should also be able to have wooden crates built for particularly fragile goods such as grandfather clocks and fine art. If you would like to reduce the cost of this part of the removal process by packing yourself then your professional removal company should be able to give you detailed advice on how this should be done. Please see our videos on packing and wrapping techniques or feel free to ask us for advice on this. 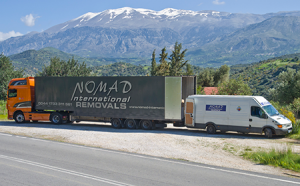 If your removal company is really a specialist in removals to Greece or removals to Italy then they will have frequent departures to and from those destinations. This gives you more flexibility in planning the timing of your removal. Also be very wary of any companies that promise delivery to a distant location on a specific date, unless they have a detailed plan for arriving several days in advance and storing your goods there first. It is simply not possible to guarantee a specific arrival date at a very distant location like a Greek island, particularly if the date is a long time in advance (unless local storage facilities are used). A professional company will be honest about this and will give you a window of time instead, only narrowing this to a specific date when they know that date for sure. Perhaps the best test of a removal company is that they are recommended by others. Ask them for testimonials from other customers who have undertaken similar removals to yours. A good company will have at least a few. A very good company will have a lot. Remember that these are the MINIMUM criteria that you should look for. In addition to the above, Nomad International prides itself on offering excellent customer service and a friendly, highly-recommended team. If you would like to know more, feel free to give us a call or send us an email. We would be happy to help.